Totapuri is grown extensively in South western part of India, particularly the Chittoor region of Andhra Pradesh in India. 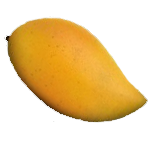 It is one of the traditional strains of mango. It can get large is size and holds its form very well even when it is ripe- this makes it ideal for salsa and other mango preparations. It is very flavorful, although the sweetness is less. Because of its strong mango flavor, its pulp is in high demand. When the mango ripens, it changes colors from green to sometimes red and yellow, the 3 parrot colors, giving it its name- Tota means ‘Parrot’. The peak season for this mango is mid-May to mid-June.